And the old men who wait patiently. 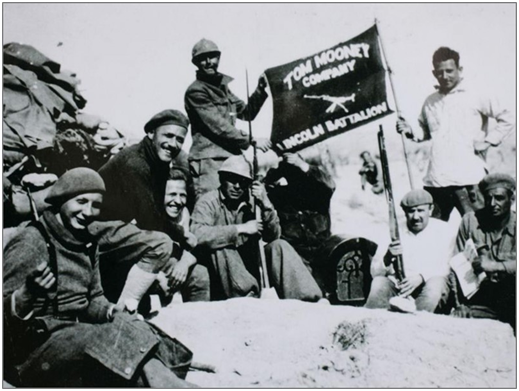 Members of the Lincoln Battalion Machine Gun Company on the Jarama Front, Spring 1937. Courtesy of Dave Smith who is holding the staff of the flag. The haunting verses of the song Jarama Valley composed by Scottish volunteer Alex McDade and set to the tune of The Red River Valley capture the essence of the Lincoln Battalion’s experience at Jarama. The lyrics capture the disastrous assault on the heights of Pingarrón on the 27th of February and the danger and tedium of their “marathon” occupation of front line positions that continued through the winter, spring and early summer. The lyrics demonstrate the volunteers’ annoyance of having a long expected leave in Alcalá de Henares cancelled after only twenty-four hours. These events and more will be highlighted on the blog. The Comintern initiated recruitment in the United States shortly after the International Brigades went into combat during the defense of Madrid. 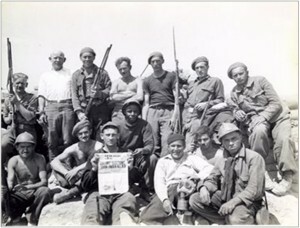 The United States Communist Party (CPUSA) utilized a variety of front organizations, including the North American Committee to Aid Spanish Democracy, to recruit American volunteers. New York City was the hub of the recruiting effort. The Communist Party’s recruiting drive reached across the country. Recruiting was generally conducted in a discreet manner from a pool of current communists and members of militant trade unions. Volunteers from outside the metro area were given put up in the Sloane YMCA or similar lodgings (Tisa, 15). Each volunteer was given $10 and instructed to apply for a passport. While they waited for their travel documents, the volunteers received limited training, primarily in close order drill, at the Ukrainian Hall on East Third Street (Eby, 9-10). The Party also provided each of the early volunteers with uniforms purchased at an Army Navy Store near 14th Street. Each man received approximately $50 worth of gear from an established line of credit. The volunteers were issued WWI-style military surplus: “khaki-twill shirts, overseas caps, pants with roll-up puttees, woolen mittens, [and] fleece lined jackets” (Eby, 12). Some volunteers also purchased hatchets and knives (Herrick, 128). To transport his kit, each man received an identical black suitcase with yellow straps. Shortly before sailing the first volunteers received a Bon Voyage party at the Second Avenue Yiddish Theater. Each volunteer was informed of the time and date of departure and provided with a gift bag consisting of “a carton of Lucky Strikes, … a Gillette Razor, two cakes of Palmolive soap and a tin of G. Washington Coffee…” (Eby, 12). The Normandie sailed on December 26th. There are differing accounts about how the volunteers spent their time aboard the vessel. Edwin Rolfe in The Lincoln Battalion portrayed the group as sober and introspective. William Herrick, one of the volunteers aboard the vessel, provided a different account. Herrick noted that the volunteers initially tried to remain unobtrusive but they quickly realized that their fellow passengers were aware that they were not the typical tourist. Herrick stated that the volunteers found the perfect cure to shipboard boredom when they discovered that a group of performers from the Folies Bergère was also aboard (Eby, 15). On the third day at sea the ship’s newspaper printed a bulletin for the benefit of the volunteers. Chairman Reynolds of the House Foreign Affairs Committee declared he would urge the Department of Justice to apply the section of the Criminal Code providing $3,000 fine or a year in prison for enlistment of Americans in a foreign war (Landis, 19). Most volunteers announced that they would worry about the bulletin when they returned to the US. The Normandie docked in Le Havre on New Year’s Eve. The men disembarked and reported to the customs shed each with his identical suitcase containing his uniform and assorted military gear. The French customs inspectors passed them through with a subdued cheer of Vive l’Espagna! (Landis, 20). 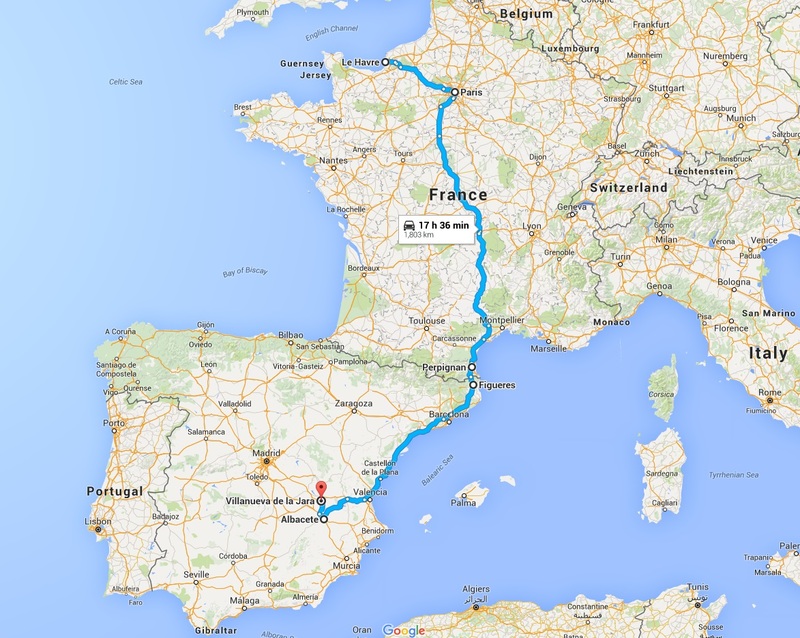 The trip through France took only a total of thirty-six hours. After a night in Le Havre the volunteers boarded the boat train to Paris at 5pm. In Paris the men stayed close to the station and departed a few hours later on a train bound for Perpignan. After arriving in Perpignan the volunteers boarded buses along with other international volunteers and crossed the border into Spain. The volunteers were routed to the international reception station, the Fortress of Figueras. They stayed there two days, breaking up the boredom with a brief parade in uniform through the adjacent town. 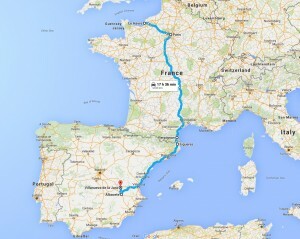 The men then boarded trains for the long slow trip to Albacete, the International Brigades Headquarters (Landis, 21). The men performed brief parades in Barcelona and Valencia as well. The volunteers arrived in Albacete at 10am on January 6, 1937. The men were enrolled in the International Brigades the following day and then trucked thirty-five miles out to Villa Nueva de la Jara. Villa Nueva de la Jara would serve as their training base until they departed for the front. In the small village the men were housed in a Monastery. Tisa diplomatically noted that they had to “clean up after the previous occupants” (25). French volunteers who had preceded the North Americans left excrement throughout the building. The Battalion began its formal military training under the command of James Harris with Sam Stember as the unit’s Commissar. Formally known as the 17th International Column the men quickly adopted their predetermined title of the Abraham Lincoln Battalion. Data is available for approximately 76 of the 80 confirmed volunteers who sailed aboard the Normandie (See Figure 1). Despite the loss of many of the early battalion records, sufficient source material remains to build a picture of the early volunteers. First, the group’s third-class tickets were booked and purchased thorough World Tourist, Incorporated (Eby, 12). It is likely that State Department agents used the names on the block of tickets to identify the volunteers travelling to Spain. These lists were compiled for each ship leaving the US until early in 1938 and are known collectively as the Sail List. World Tourist likely added other non-volunteer travelers to the block purchase which likely account for some of the names that remain unconfirmed on the Sail List. * Unconfirmed volunteer, likely served outside the IB, an alias used by an unidentified volunteer, or were normal passengers listed as a volunteer in error. A small number of first-hand accounts by early volunteers are also available. William Herrick’s Jumping the Line and John Tisa’s Recalling the Good Fight are both excellent sources. Tisa’s work should be read in conjunction with the wartime pamphlet he wrote The Story of the Abraham Lincoln Battalion, Written in the Trenches of Spain. Documents from the Russian State Archive of Socio-Political History (RGASPI) shed additional light on the volunteers. Several brief lists are preserved providing in some cases date of arrival, age, vocation, military experience and political affiliation. An undated document titled “Roster of the Lincoln Brigade” from (RGASPI Fond 545, Opis 6, Delo 47 ll. 3 and 4 provides excellent information related to the first group of volunteers. The average age of the first group of volunteers was 31. The youngest was Richard Kenney at 18. The oldest was the Finnish American Anton Ulvi at 50. The Majority of volunteers were between the ages of 18 and 30. Almost every volunteer in the first group self-reported some form of military service. Only nine stated that they had no military experience whatsoever. The largest group had served in some capacity in the army. Note that this data is somewhat imprecise. It is not clear whether a volunteer who is listed as “Infantry” served in an active duty, Reserve or National Guard capacity or if they were in the US Army or Marines or in a foreign nation’s force (See Figures 3 and 4). * John Scott completed officer training school in England. The first group of volunteers possessed a wide range of skills. Most were skilled tradesmen or workers from diverse professions. Seamen and food service workers made up the largest groups. The number of maritime worker would grow as more volunteers arrived and many found their way into the Machine Gun Company (See Figure 5). The vast majority of the initial volunteers were Communists. As noted previously, the initial recruiting of volunteers was heavily focused on current party members. Only a handful of volunteers were not Communist or Young Communist League members. Three of the five who did not list their affiliation as Communist were Members of the International Seaman’s Union which dissolved into the National Maritime Union in 1937. The other two noted membership in the Teamsters and Ship Builders unions. Later groups of volunteers would contain larger groups on non-communist volunteers but the majority of volunteers throughout the war were party members (See Figure 6). It should never be forgotten the men who went to Spain went as soldiers. For many of the initial volunteers, Spain would prove to be their final resting place. By the end of February, 12 of the volunteers who sailed aboard the Normandie were dead. An additional 26 would die during the course of the war. Lincoln Battalion, Maritime Workers, Spring 1937, ALBA/VALB.